At some point in the past few months Comedy Central made one of the best decisions they have probably ever made. They started showing reruns of The Office. And they started showing a lot of them. Reruns all day on Sunday, reruns on weekday nights, reruns randomly on during the day. There didn’t seem to much strategy behind their decision beyond simply running episodes as often as possible. It was brilliant move. I have since found myself on numerous occasions randomly jumping into whatever episode is on and then watching the one that followed it and then possibly at least a good chunk of the one that followed that one. This development has all but solidified two things I believe to be true when it comes to The Office. 1. The Office is a top 5 sitcom of all time. Possibly in the top three. 2. The Office is one of the most re-watchable shows in the last decade. This second item was first realized “back in the day,” when TBS would do Office Tuesdays. Office Tuesdays featured anywhere from four to six episodes of The Office each night, episodes selected at random, dropped at random. Office Tuesdays became a weekly event for me and even though I owned the first few seasons on DVD and thus had the ability to watch any of those episodes I wanted whenever I so chose, I still rode with Office Tuesdays. Those nights consisted largely of episodes from the show’s first four seasons and of the sixty of so episodes involved, there really isn’t a clunker in the mix. So Office Tuesdays was as sure of a bet as there was in the pre-DVR era. While the first four seasons of the show are pretty much infallible, the three that followed aren’t as strong. That’s grading on a curve though. Seasons 5-7 of The Office are still better than most of what else is on television and it’s not as if they’re bad. Far from it. They just aren’t as strong from start to finish as seasons 1-4. But they are definitely better than the two seasons after the season 7 finale, when Steve Carrell left the show. The show’s last two seasons never really clicked, as they cycled through replacements, both internal and external, to help fill the void created by Carrell’s departure. Yet somehow, and this will always be a testament to the show’s greatness, despite the stumbling and fumbling of the final two seasons, the show was somehow still able to stick the landing when it came to the series finale. The show’s finale aired five years ago today on May 16, 2013. Dwight and Angela got married, Carrell came back for the ceremony and the documentary that was being filmed the entire time finally aired. It was an immensely satisfying end to a show that had become a classic during it’s nine season run. Now five years later the show lives on thanks to the reruns on Comedy Central and the magic of Netflix. But there are also a lot of episodes there to choose from. With at least twenty per season, that’s like…uh…a lot of episodes. So, with that being said, here are Giddy Up America’s twenty most re-watchable episodes of The Office. Come for Dwight’s fire safety training, stay for Michael realizing he’s the one who makes everyone so stressed. Jan’s extravagant lifestyle is creating massive money troubles for Michael, forcing him to take a second job selling products over the phone. When forced to quit his side hustle, Michael takes Creed’s suggestion to declare bankruptcy, only to quickly learn that simply saying you declare bankruptcy isn’t exactly how it works. The idea of cringe-creating comedy didn’t start with The Office, but they definitely helped perfect it via Michael Scott. “Christmas Party” is one of the best examples of this, as Michael changes things up at the office Christmas party. What was once a Secret Santa becomes a Yankee Swap after Michael gives Ryan an iPod, but receives an oven mitt from Phyllis. “It’s like this tangible thing that you can point to and say, ‘Hey, man, I love you this many dollars worth,’” Michael says at one point. Keep your eye on the tea pot, there’s actually gifts inside the gift. Hey, we learn what Creed’s job is. It’s quality assurance. Cool. Although not cool, because a bunch of paper was sent out with an obscene image on it, sending Michael into chaos mode to squash the oncoming public relations disaster. It’s Threat Level: Midnight people! This episode also features one of the show’s most famous cold opens, with Jim impersonating Dwight, as well as the reveal that Andy was apparently dating a high school girl. “Lord, beer me strength” indeed. And yes, you should be perfectly comfortable in a long-sleeved tee. There’s a gay person in the office and Michael and Dwight handle it about as well as could be expected. In the end, Oscar is outed against his will and on top of that, kissed by Michael against his will. This episode was Dwight’s coming out party, as he was tasked with picking a health care plan for the office because Michael didn’t want the responsibility or more specifically, the problem with being the bearer of bad news when the office hears what kind of crappy plan they’ll end up with. Instead, Michael busies himself with coming up with a morale-booster for the team. Meanwhile Dwight is trying to decide which diseases his co-workers are listed are real and which ones are fake. Okay. Jim and Pam are finally dating, Pam buys a lamp, Michael hits Meredith with his car, but in the process learns she has rabies, which of course leads Michael to organize a run to raise awareness for rabies, something everyone was pretty much already well aware of. Michael proceeds to eat too much pasta, cramps up and finishes the race barely walking and throwing up. Oh, and Pam walks in on Michael changing. 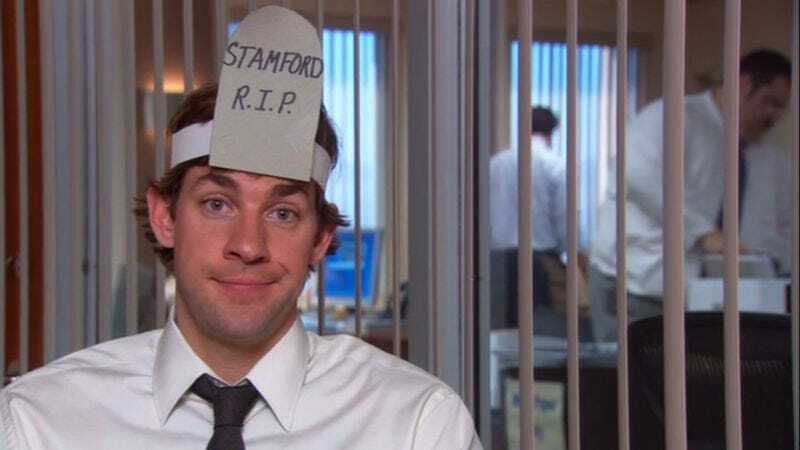 Just like with the Michael Scott Paper Company, when Jim ran away to work at the Stamford branch, it was generally assumed he’d be back in Scranton at some point. When that time did come, he brought some Stamford folks with him, most notably Karen and Andy. Unfortunately Tony did not stick around. The bond between Michael and Dwight is a strong as they come, but rough patches befall even the best of friendships. As a result, Michael and Dwight throw down in the dojo Dwight attends karate lessons at, even though according to him, Michael learned to fight on the streets. No rules on the street. Well, one. No shots to the groin. Home for dinner. You down with the Dundies? Not many people were. Oscar compared it to a children’s birthday party, where the adults all begrudgingly go along with it because their kid (Michael) is having so much fun. Pam got wasted, got kicked out of Chili’s and then almost kissed Jim. But please, keep your acceptance speeches short. Dwight will be timing them. Of course Michael thinks he’s a good basketball. Of course Michael isn’t a good basketball player. Michael also assumes Stanley is good at basketball, because you know. But turns out, not so much. Stick around because Kevin proves to be deadly from outside. When Michael found out Oscar was gay, he botched that about as magnificently as possible. The same could be said for when Michael learns that one of his new employees from Stamford did some time in prison. First Michael tries to teach everyone about prison via one of his many fantastic characters, Prison Mike, who eats gruel and is tormented by the dementors. He even gives them outside time. Then, again feeling threatened and inadequate, he decides to show everyone how lucky they are not to be in prison by locking them all in the conference room. “Abraham Lincoln once said that if you’re a racist, I will attack you with the North,” Michael says at one point, which may or may not be entirely accurate. Let’s see. There’s Michael’s flat screen TV which is the size of a toaster, but still one of his most prized possessions, the busted sliding door, which was broken when he thought he heard the ice cream truck, the foot rest at the end of the bed that he sleeps on to give Jan more space and of course, the timeless music of Hunter, Jan’s former assistant. Yet the episode is a Mount Rushmore episode, one of the best ones they did. It’s hilarious, cringe-worthy, uncomfortable, sad and sweet. Michael goes to Alicia Keys’ concert, presumably by himself, secures some sweet seats and is handed a cigarette by a girl with a nose ring. Turns out the cigarette was a joint and turns out Michael left it in the office parking lot, where it was found by Dwight. “So, yesterday, Dwight found half a joint in the parking lot – which is unfortunate because, as it turns out, Dwight finding drugs is more dangerous than most people using drugs,” Jim says. Dwight takes it upon himself to investigate, questioning everyone from Oscar (a potential drug mule) and Creed (more knowledge about strains of weed than Dwight) and bringing in someone to test everyone and yes, it must be urine. The episode features a damn near perfect exchange between Jim and Dwight. Jim: I’m just saying…that you can’t be sure that it wasn’t you. Dwight: That’s ridiculous – of course it wasn’t me! Jim: Well how could you if it just erased your memory? Dwight: Knock it off – I’m interviewing you! Jim: No! You said I’d be conducting the interview when I walked in here – now exactly how much pot did you smoke?! In the end, Dwight is forced to resign as a volunteer sheriff’s deputy, but once again proves his undying loyalty to Michael. Michael Scott is a simple man with simple desires. For example, every morning he likes to wake up to the smell of cooked bacon. Pretty simple. So of course every night, he lays out a few strips of bacon on his George Foreman Grill and when his alarm goes off, he turns the grill on and falls back asleep so he can then wake up to that desire aroma of cooked bacon. However, tragedy strikes when he accidentally steps on the grill and burns his foot. 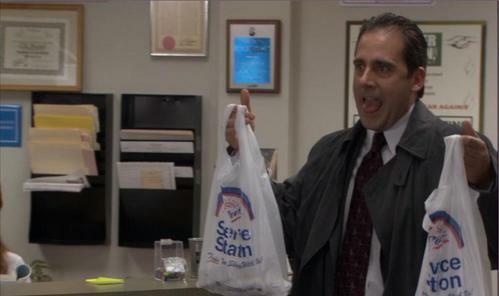 Some bubble wrap and a concussed Dwight later, we have the most re-watchable episode of The Office.